The UN Security Council has approved the creation of an international court to try suspects in the murder of former Lebanese Prime Minister Rafik Hariri. The resolution was adopted by 10 votes to zero, with five abstentions from Russia, China, South Africa, Indonesia and Qatar. The court's creation is the subject of intense political debate in Lebanon. 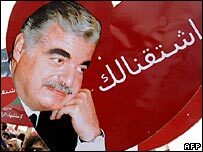 Mr Hariri and 22 others were killed in a massive car bomb in the capital, Beirut, on 14 February 2005. Lebanon now has until 10 June to ratify the proposal, otherwise the Security Council may independently authorise a tribunal, as it did in Rwanda and the former Yugoslavia. A UN investigation after the killing implicated Syria and Lebanese security forces in the attack, although Syria strongly denies any involvement. Four pro-Syrian Lebanese generals have been under arrest for more than a year, accused of involvement. Following the vote, Syria reiterated its stance that the special court violated Lebanese sovereignty and could plunge Lebanon into further instability. "Definitely this is something that goes against the interests of the Lebanese people and Lebanon as a whole," the country's UN ambassador Bashar Jaafari said. Lebanese Prime Minister Fouad Siniora welcomed the vote. "The ratification of the international tribunal does not, and should not, be considered as a victory for one party over another Lebanese party. It is not a victory for one group over another. It is a victory for Lebanon, and for all the Lebanese," he said. Saad Hariri, the son of the assassinated politician, said the tribunal was a turning point for the country and "an opportunity for all Lebanese to unite". Speaking live on Lebanese television, he said the time had come for justice. Russia's UN Ambassador Vitaly Churkin said the resolution was "essentially an encroachment upon the sovereignty of Lebanon". China's UN Ambassador Wang Guangya warned that only a tribunal supported by all Lebanese factions could be effective. The council's move "will give rise to a series of political and legal problems, likely to add to the uncertainties embedded in the already turbulent political and security and situation in Lebanon," he said. There is a hope here that it will end a long, sad history of unpunished political assassinations, says the BBC's Kim Ghattas in Beirut. People are on edge after a series of bomb attacks last week and an ongoing bloody standoff in northern Lebanon between the army and militants from the Fatah al-Islam group, our correspondent says. However, the Security Council was divided on the issue. The abstaining countries argued that the situation in Lebanon was so fragile that the Security Council should not be imposing the tribunal on the country. The US, UK and France argued that political assassination should not go unpunished, and that the Lebanese government had asked the Council to act. There was also an argument about why the court was being set up under Chapter VII of the UN Charter, meaning it could ultimately be enforced by military action. Chapter VII was used to justify the 2003 invasion of Iraq. However, the US and its allies argued that only Chapter VII resolutions were legally enforceable. Syrian President Bashar Assad has said any Syrian suspects would be tried in Syria and he would not release them to a tribunal. An interim UN investigation found Mr Hariri's killing was "probably" politically motivated and has implicated Syria, but Damascus has denied any involvement in his death. 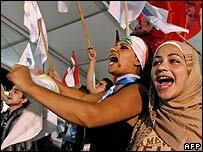 In 2005, Syria withdrew its troops from Lebanon after a presence of 29 years, following massive domestic and international pressure after the assassination of Mr Hariri.